River Water-crowfoot is the collective common name of the several species most frequently seen in rivers, but others, including Ivy-leaved Crowfoot (Ranunculus hederaceus) occur in some places, and are close to water if not actually in a stream or river. 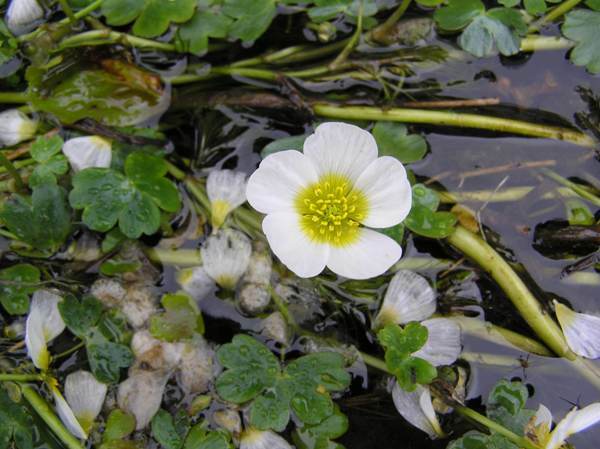 Above the surface, the leaves of Ranunculus fluitans are very similar to those of other members of the buttercup family, while the submerged leaves are finely divided: characteristic of a truly amphibious plant. The flowers are at their best from mid-May until the end of June, and on sunny days their bobbing heads contracting with the blue sky reflected in the water surface make a wonderful picture. 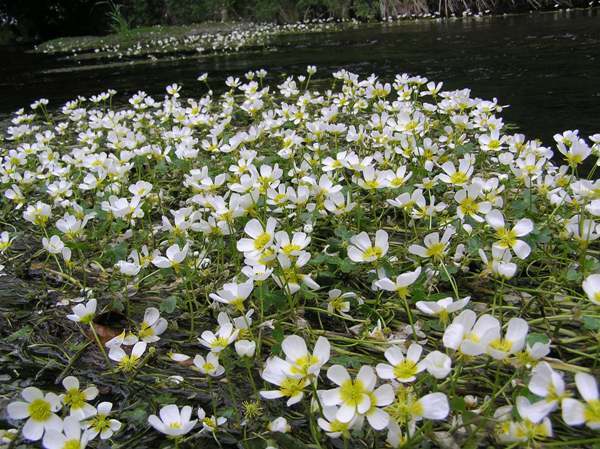 Slow to moderate paced lowland river reaches of shallow depth, especially where the river bed contains limestone, are places where this lovely water plant is most plentiful. Ranunculus provides essential in-stream habitat for freshwater shrimps, snails, insect larvae and nymphs. 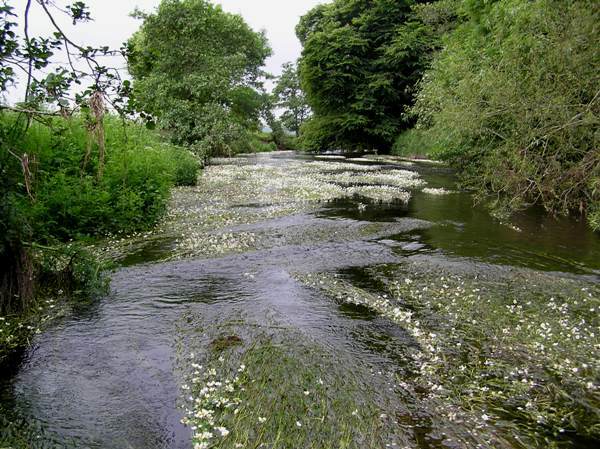 In stream grazing by cattle can rapidly destroy these delicate submerged weedbeds, and so buffer zoning, by means of stock-proof fencing, is a good way of protecting not only the bankside and marginal plants but also in-stream weeds such as water crowfoot. The pictures on this page were taken on the River Slaney in southern Ireland and the River Teifi in West Wales in July.